All reefing lines, Halyards lead to cockpit. GRP with Vinylester Kevlar re-enforced hull. This vessel was another unfortunate victim of Hurricane Irma that hit the BVI. She has very minimal cosmetic damage but sadly the damage is pretty extreme to the keel and attachment there of, going aft to the rudder mount which has de-laminated and exposed the bearing and in areas damage has pushed through to the sole at the companion way. There is work to be done straightening the radar arch stainless and starboard stanchions. 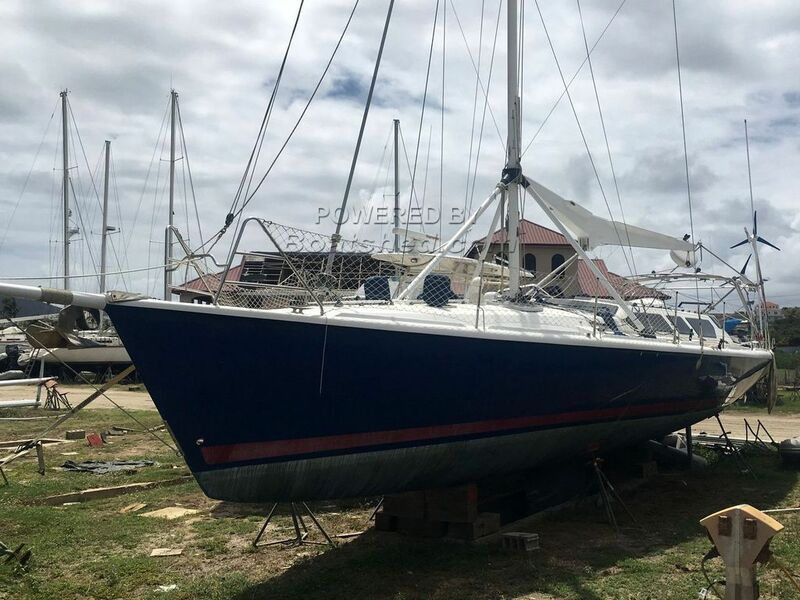 One can see that she had been meticulously cared for by the owners and did not spare on the care of the vessel but since the storms has deteriorated rapidly. This Hunter HC50 Hurricane Damaged Boat has been personally photographed and viewed by Justin Smit of Boatshed BVI. Click here for contact details. Please note this comments section is public. Please do not post your personal details here. To enquire about purchasing this boat, please contact the broker directly at justinsmit@boatshed.com. Please read our commenting guidelines before posting.